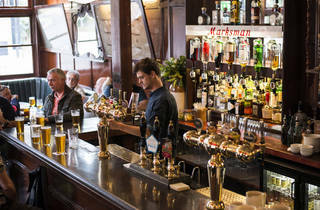 A hotly awaited revamp of cherished Hackney boozer The Marksman, with high-calibre cooking and must-try on-tap offerings. 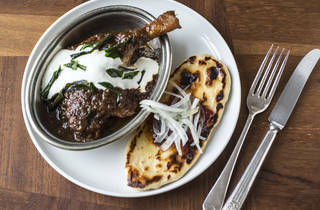 The first-world conundrum of whether to dedicate Saturday night to fine dining or serious drinking is tackled head-on by the folks behind the relaunched Marksman. 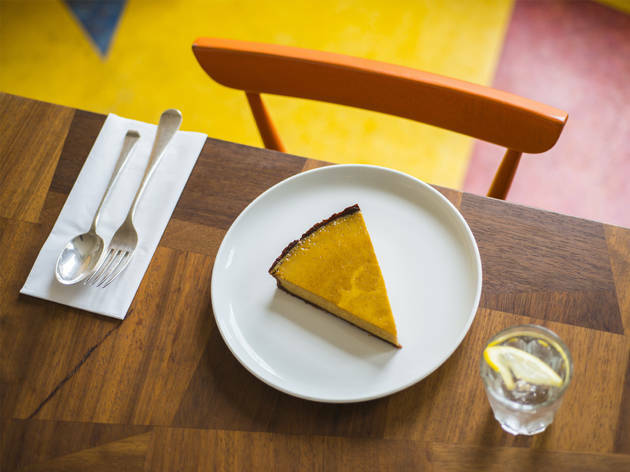 This is the latest addition to Hackney Road’s swelling crop of new and refurbed bars and restaurants. The owners decided have made few changes to the interior of this much-loved boozer, which means that the bar has retained many of the locals who used to prop it up. 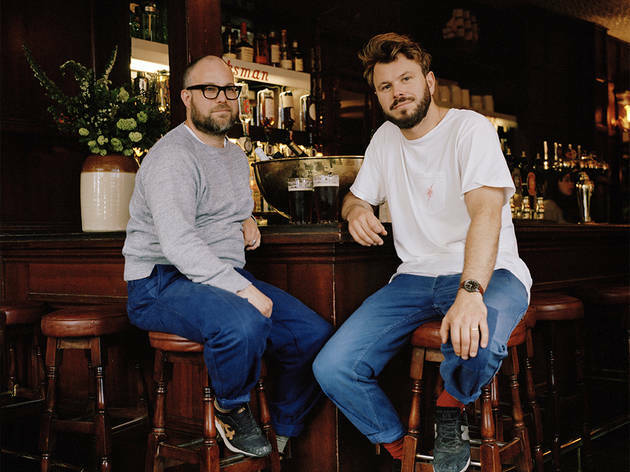 What has changed is the food, courtesy of head chefs and joint owners Tom Harris and Jon Rotheram, whose CVs include stints at St John, One Leicester Street and Fifteen. 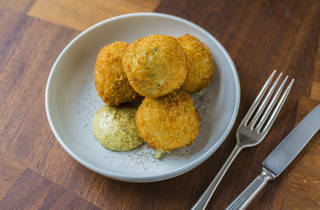 Starters of devilled crab on toast, or beef and barley bun with horseradish cream (the house speciality) are attention-grabbing options, but our fried salt hake and potato rissoles stole their thunder: perfect morsels with delicately crisp exteriors that gave way to butter-smooth centres. 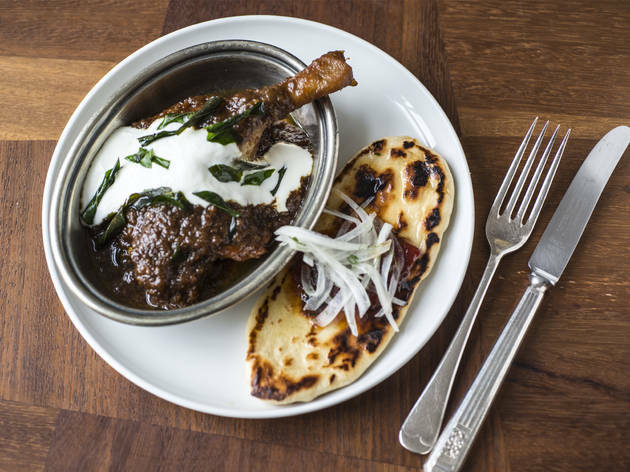 Mains stray even further from the gastropub script: curried duck with sourdough roti and tomato chutney (£16) was deliciously savoury, rich in ghee, and extraordinary in texture; the type of dish that stays in your thoughts. For dessert, a brown butter and honey tart was so light it was a mystery of culinary engineering. If you can’t get a table, must-try on-tap offerings and excellent bottled beers should soften the blow. Opt for the seasonal specials or the Duchesse de Bourgogne, with a hint of tang from balsamic vinegar. The Marksman isn’t cheap, but it’s good value for the calibre of cooking. Although there are plans to move the dining room upstairs come autumn,it’s great to get such confidently prepared food in such a convivial, low-maintenance environment. Dinner here is like having your low-end/high-end cake and eating it too. 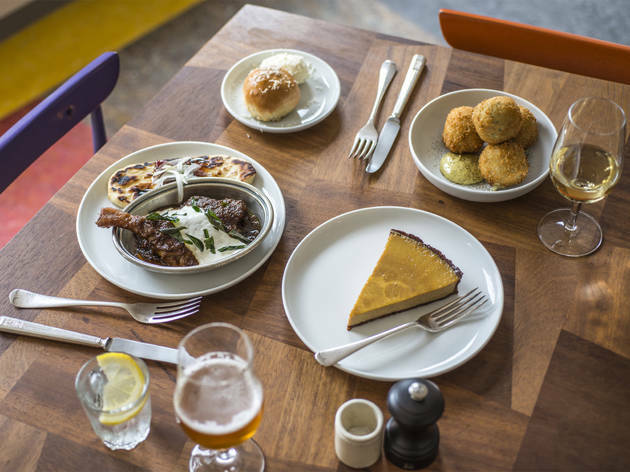 Meal for two with drinks and service: around £95. I took the opportunity to finally eat at the Marksman. 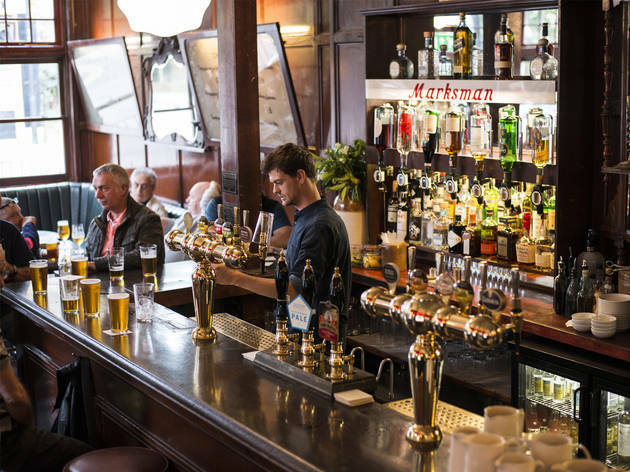 The Marksman on Hackney Road is no stranger to accolades, its No.10 on the Estrella Damn list of Top 50 Gastropubs and was Michelins pub of the year in 2017, not bad considering it was refurbished and reopened in 2015. Down stairs it’s a straight up boozer, upstairs the restaurant is beautiful and stylish but casual and welcoming. When I booked I told them what lead to us their door that Friday evening. They treated us like old friends, ushering us to a table upstairs. Before we were even settled, two saucers of the Marksmans Prosecco appeared in front of us. It’s a very good start. This is rapidly by followed by a beef and barley bun with horseradish cream. 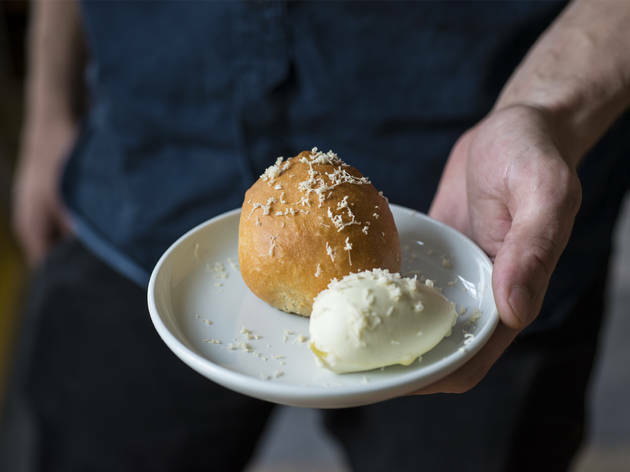 It is a plate of contrasts, the sweet, soft bun is filled with warming, meaty flavours. The cool, light, whipped cream is topped with the clean fire of horseradish. Its really quite brilliant. From the starters we choose Pink Fir, Tunworth and wild leeks, because it’s essentially cheese potatoes and I’m not sure there is anything not to love about this. And indeed the potato’s are waxy and the cheese pungent and salty, with a gentle hint of mustardy heat. We decided against the recommendation of our waiter Andrew because it was cold and opted for, yes, a different cold starter, Cured Beef, beetroot and sour cream. It’s enveloped by slightly bitter raddicio adding crunch.The beetroot is sweet with earth undertones, paired brilliantly with the sharp sour cream. The beef, which is cured inhouse is like slivers of stained glass on the plate. It’s IW’s birthday so despite being tempted by the sharing pie she plumps for Cod, Monks Beard and smoked roe. It’s bathed in a rich buttery sauce, the fish is soft and flakes at the touch of a fork. My roasted wood pigeon, beetroot and red cabbage was at the other end of the taste spectrum. The meat was rich and gamey, perfectly complimented with the sweet cabbage and earthy beetroot. Let me not forgot to tell you about the fried potatoes which are worthy of a trip here alone. Layer upon layer of paper thin potatoes, cubed and fried until golden. Be still my heart. One dessert would almost certainly have been enough but it was IW’s birthday and she was allowed whatever she wanted. 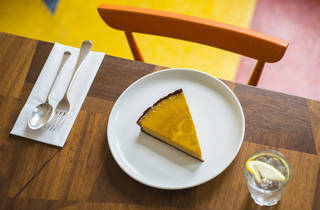 Andrew had told us on arrival he had kept us a slice of the brown butter and honey tart. It arrived with a single birthday candle burning brightly and two glasses of dessert wine. Exactly which wine I forget, as we had almost the finished a very good, fruit filled smokeyBeaujolais., and we may have had a bottle before arriving. The tart was beautiful, crisp pastry filled with a rich buttery custard. We finished with the chocolate, Crème fraiche and honeycomb. It was indulgence in a bowl, rich, dark, mousse at the bottom of which lay sour, sharp Crème fraiche and nuggets of honeycomb taken to almost burnt adding texture. Service was fantastic, all the staff were brilliant, not least when our neighbours poured a glass of red wine over my coat. The number of condiments and solutions that appeared to clean it were hysterical.The bill was £138 including service, and I'm planning a trip back for Sunday roast very soon. As soon as I stepped in the door I knew this place was special. It has an old school mahogany charm from the original Marksman signs to the waiters waking around with an old fashioned arm behind their back and blue apron. Apparently this place is always booked up but we managed to sneak a table for two at 2pm on a Sunday afternoon because we were lucky. I would recommend sharing a roast as the chicken we picked was phenomenal! It was £29 for 2 courses and came with lovely things like roasties and bread sauce. 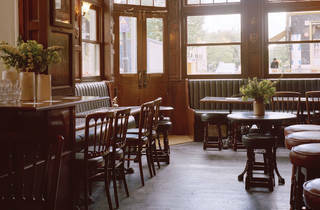 This place is in a league of its own and a stones throw from the other pubs on Columbia road. I had really been looking forward to going for dinner at the Marskman as I had read some really good reviews about it and recently heard Michelin awarded it the title of best pub for food in the UK. Sadly I was completely disappointed by my Friday night dinner here. We arrived for our reservation at 8:30 and the whole place was hectic. We checked in with the hostess but she had to wait five minutes before she could tell us what table we were sitting at since the manager was on the phone and hogging the iPad with the seating plan. While we were waiting, we went to order a drink. They were already out of the house lemonade so I ended up going with an Aperol Spritz which was one of three cocktails on the menu. Once were were seated in the dining room, we waited 10 minutes for our server to come by and offer us water. Throughout the whole meal the empty wine glasses that were on the table when we sat down were left, even though they were in the way. We started with pickled aubergine with lemon salt and roast carrots with goats curd. The aubergine was really chewy but the carrots were delicious. We then waited a long time for our mains - an hour from when we ordered them. I went for the £14 vegetarian pressed artichoke and cotherstone cheese and my boyfriend went for the lamb. I couldn’t actually see any artichoke in my dish and had to ask if what I had been served was even what I had ordered. It turns out there were a few slivers of artichoke tucked into a sliced potato cake and the cotherstone cheese reminded me of salad cream. I don’t actually think it was even cotherstone as that's supposed to be a hard cheese. I would rather have just had our sides of roast potatoes and greens as my main as they were really good and only cost £4 each. The £20 lamb was stringy and came out luke warm and my boyfriend said the best part of the dish was the sauce. The decor on the ground floor was nice and traditional, but the upstairs dining room was modern with a strange linoleum floor and the servers prep area in the room. I found this distracting and the atmosphere felt quite frantic as the servers seemed to be running around panicked all night even though there were only 10 tables to look after. The table next to ours asked to have the service removed from their bill as they had waited so long for their food. We thought about asking the same thing but opted not to in the end because our server was very nice. I wonder if The Marksman is now in over it’s head since the Michelin announcement. Even if this is the case, I will not be going back again to see if they improve in the future. Amazing food and atmosphere. 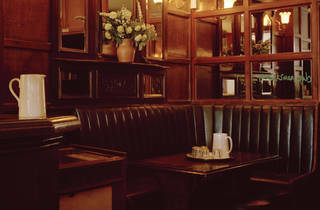 Retains the charm of a traditional pub plus has exceptional food to go with it. I love the contrast between the dining room upstairs and the more sympathetic pub look downstairs. Don't order the roast beef for Sunday lunch. Was really tough and virtually inedible. Let down by failure to execute a good main course - and they didn't like it when I told them. Their Sunday lunch pales in comparison to the Bull and Last and even locally Resident of Paradise Row is much better. Overly hyped up. I would give it a miss if your thinking of trying it, and try somewhere else you fancy instead, rather than chancing it at the Marksman. 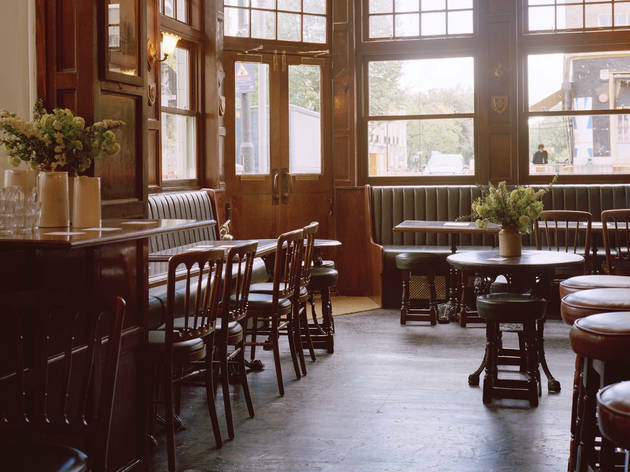 As a local who liked the Marksman as a boozer where everyone was welcome be it the old time East-enders to the blokes who've just finished a post work game of footie in Haggerston Park, I was pleased to see they've left the downstairs as it was and open to all - no need to book here. But they've also created a beautiful upstairs dining room with textiles lining the ceiling, bright lino on the floor and wonderfully dipped silver light bulbs. The food is outstanding. Fresh, innovative and downright scrummy. The roast chicken I had was the most tender and juicy I've ever had. My only comment of what was a fab experience - the staff were not so welcoming. My party had already arrived and were seated upstairs. I was stopped by two members of staff trying to stop me from going upstairs demanding what my name was and who I was with. Not the greatest start but soon forgotten. I'll not affect their star rating because of this because the place is so nice and the food so damn tasty. 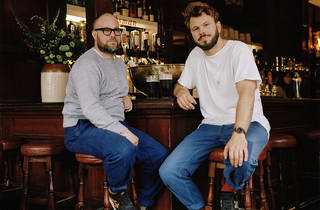 The Marksman should be touted as the apex of the ultimate Sunday in East London. 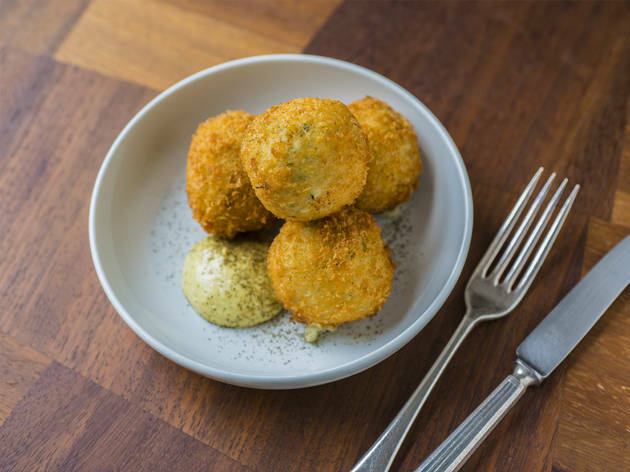 It's located on Hackney Road, just off the corner of Columbia Road Flower Market so it's perfect for a long, boozy Sunday lunch and then an amble down to the flower market to pick up some cut price blooms. 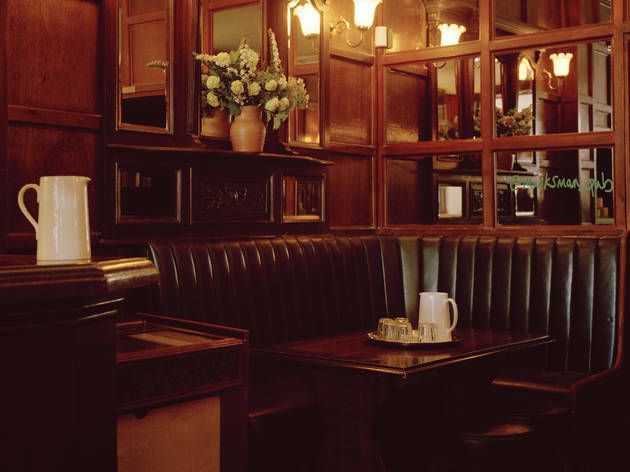 The downstairs is an old-fashioned boozer; the kind that looks like it's always lamplit. The upstairs dining rooms are airy and spacious and decorated in a clean and colourful Scandinavian style. But that's by the by when you get food of this quality. Pub roasts are always a gamble but this is a gamble that paid off. 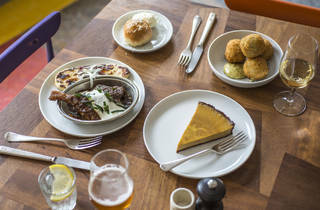 The meat was beautifully cooked and incredibly tender; the potatoes were crispy, salty shards without and fluffy within; and the famed brown butter and honey tart is as amazing as everyone says. 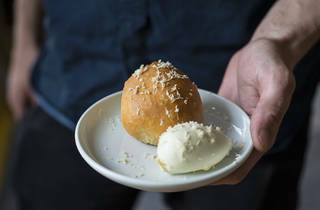 It comes plated on its own which is a sign of the kitchen's confidence in this confection: no need for the distraction of cream or any other accoutrements. All you need is the taste of flaky, butter-rich pastry and ethereally-light custard with the caramelised notes of brown butter. Very good food but very disappointing service. Drinks orders were forgotten, things were brought at the wrong time, items that weren't ordered were delivered. Still, that mutton curry is absolutely epic and the desserts (particularly the brown butter and honey tart) are out of this world. Beautiful setting, too – it's just a shame the staff don't do the place justice.